Maya Portillo is shown outside the New York lab where she studies how children from different socioeconomic backgrounds develop language skills. In a system that benefits her wealthier classmates to a surprising degree, Portillo was one of a small number of low-income students who managed to enroll at and graduate from Cornell University. 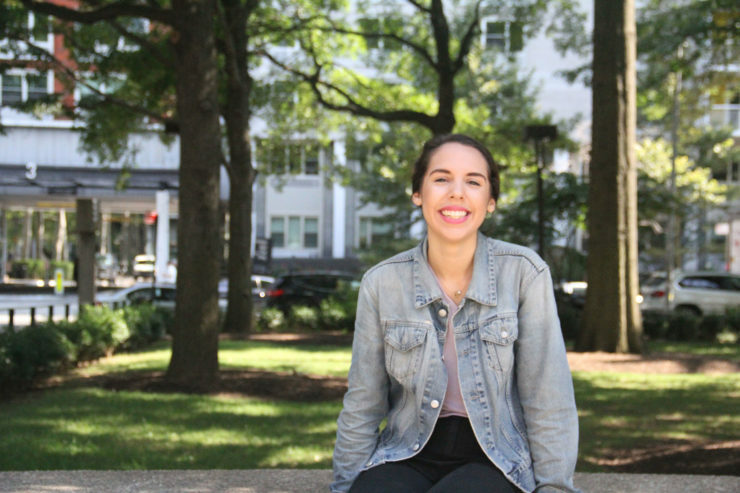 ITHACA, N.Y. – Maya Portillo started life solidly in the middle class. Both her parents were college graduates, they sent her to a Montessori school, they took family vacations and they owned a house in Tucson, Arizona, filled with the books she loved to read. Then, when she was 10, Portillo’s father left, the house was foreclosed on and the recession hit. Her mother was laid off, fell into debt and took Portillo and her two sisters to live a hand-to-mouth existence with their grandparents in Indiana. Portillo recounted this story in a quiet conference room on the pristine hilltop campus of Cornell University, from which she was about to graduate with a major in industrial labor relations and minors in education and equality studies. Her long path from comfort to poverty and an against-the-odds Ivy League degree gave her firsthand exposure to how even the smartest low-income students often succeed despite, rather than because of, programs widely assumed to help them go to college. This is happening as tens of billions of dollars of taxpayer-funded and privately provided financial aid, along with money universities and colleges dole out directly, flows to their higher-income classmates. It’s a little-known reality that reflects – and, because higher education is a principal route to the middle class, widens – the American income divide. And at the same time that the fight over issues including health care and changes in tax law has reignited the national debate over income inequality, financial aid disparities are getting worse, driven by politics, the pursuit of prestige and policies that have been shifting resources away from students with financial need. The result? “We’re not helping the right people go to college as much as we should,” said Ron Ehrenberg, a Cornell economist and director of the university’s Higher Education Research Institute. At least 86,000 more low-income students per year are qualified to attend the most selective universities and colleges than enroll, according to a study by the Georgetown University Center for Education and the Workforce. On standardized admissions tests, these students score as well as or better than those who do get that privilege. It’s not because selective institutions can’t afford to help low-income students, the Georgetown study said. The 69 most prestigious universities boast endowments averaging $1.2 billion and posted typical annual budget surpluses of $139 million from 2012 to 2015, the most recent year for which the figures are available. Cornell has a $6.8 billion endowment and took in $390 million a year more than it spent during that time, the study said. Yet federal data show that 15 percent of its students are low-income, based on whether they qualify for a federal Pell Grant. Nationally, 33 percent of all students are low-income by this measure, the College Board reports. Children of parents in the top 1 percent of earnings are 77 times more likely to go to an Ivy League college than those whose parents are in the bottom 20 percent, a National Bureau of Education Research study found. “Polishing the privileged,” one policymaker calls this. But it’s not just Ivy League or even private institutions where the percentages of less well-off students are low. Some taxpayer-supported public universities enroll very small proportions of them. At the University of Virginia, for example, 12 percent of students come from families with incomes low enough to qualify for Pell Grants, federal data show. It’s not because there aren’t plenty of low-income students who qualify, research by the Institute for Higher Education Policy found. At Pennsylvania State University’s main campus, for example, 15 percent of students are low-income, but the study showed that twice that proportion would meet admissions requirements, meaning Penn State could graduate 900 more lower-income students per year. If such a change were made by all the universities and colleges that now take fewer lower-income students than they could, the report concluded, 57,500 more low-income students per year would be earning degrees. Even low-income students with the highest scores on 10th-grade standardized tests are more than three times less likely to go to top colleges than higher-income students, according to the Education Trust. More than a fifth of those high-achieving low-income students never go to college, while nearly all of their wealthier counterparts do. In some cases, that’s because low-income prospects are discouraged by the cost. It’s a legitimate worry. Even though – as institutions argue – low-income students may be eligible for financial aid they’re not aware of, that money seldom covers the full price of their educations or enough of it that they could afford the rest. Portillo, for example, got comparatively generous help but still had to pay $3,500 a year she didn’t have, plus other expenses, such as mandatory health insurance. So she borrowed $21,000 over the course of her education, which she’ll have to repay out of her salary working at a New York City charter school for low-income students. Students who don’t need the money, meanwhile, keep getting more of it. At private universities, students from families with annual earnings of $155,000-plus receive an average of $5,800 more per year in financial aid than a federal formula says they need to pay tuition; at public universities, they get $1,810 more than they need, according to the College Board. College is expensive even for the wealthiest of families, of course, and even more so if they have children close to each other in age or live in places with high costs of living, Ehrenberg said. But those are families whose kids would “absolutely” go to college without such help, he said. This system has evolved because, with enrollment in decline, colleges and universities are vying for a shrinking supply of students – especially for students whose parents can pay at least some of the tuition, whom they lure by offering discounts and financial aid. All of this means that, in spite of promises from policymakers, politicians and colleges themselves to help the least-wealthy students, the net price of a higher education after discounts and financial aid is rising much faster for them than for the wealthiest ones. While higher-income students still pay more overall, federal data show, since 2012, the net price for the poorest students at Cornell has increased four and a half times faster than for the richest. Cornell wouldn’t talk about these issues. A spokeswoman said no one at the university was available to discuss them at any time over a three-week period. A mile away at smaller Ithaca College, however – which has one-twentieth as big of an endowment as Cornell but enrolls a larger proportion of low-income undergraduates – Student Financial Services Director Lisa Hoskey said all higher education institutions have to deal with the complicated calculus of attracting enough families that can pay to keep their campuses going. Wealthier families now have come to expect financial aid, and they negotiate for more – something lower-income ones without college-going experience may not know they can do – said Hoskey, on whose office wall hang thank-you notes from students she’s helped. Portillo gets that. “It’s like a business, right?” she said. “I understand where the university is coming from. At the same time, it’s difficult, as somebody who is low-income,” to pay for college without more help. Colleges’ shifting of some of their financial aid to higher-income students who could kick in toward salaries, facilities and other things means taxpayer-supported government policies are largely left to support low-income ones. But those policies, too, disproportionately help the wealthy, often through hard-to-see tax subsidies. “These programs do not get at basic public policy issues, which is that if you’re a bright kid coming from a relatively low-income family, your chances of enrolling in and eventually completing college are much, much lower than a less-talented student coming from a wealthy family,” Ehrenberg said. It starts with savings. People who set up college savings accounts, called 529 plans, get $2 billion a year worth of federal tax deductions – projected by the Treasury Department to double to $4 billion a year by 2026. Yet the department says almost all of these benefits go to upper-income families that would send their kids to college even without them. Only 1 in 5 families earning under $35,000 a year even knows about 529 plans, a survey by the investment firm Edward Jones found. States forgo at least an additional $265 million in their own tax breaks for holders of 529 plans, according to the Brookings Institution. Once they pay for college, Americans are eligible for federal tuition tax breaks. But those breaks also disproportionately benefit higher-income students and have grown to exceed the amount spent annually on Pell Grants for lower-income ones. The tax deductions cost the federal government $35 billion a year in forgone revenue, according to the Pew Charitable Trusts. That’s 13 times more than in 1990, even when adjusted for inflation. More than a fifth of the money provided under the principal deduction, the American Opportunity Tax Credit, goes to families earning between $100,000 and $180,000 per year, the Congressional Research Service found. It also found that 93 percent of recipients would have gone to college without it. Other funding for students is also unequally applied. Portillo earned some cash toward her expenses by getting a work-study job on campus, part of a nearly $1 billion federal financial aid program that pays students for jobs such as shelving library books and busing tables. But because of a more than 50-year-old formula under which work-study money is distributed, it skews to more prestigious private universities with higher-income students. These schools enroll 14 percent of undergraduates but get 38 percent of work-study money, while community colleges – which take almost half of all students, many of them low-income – get 20 percent, according to the Center for Analysis of Postsecondary Education and Employment. A student at a private university from a family in the top quarter of income is more likely to get work-study money than a student at a community college from the bottom quarter. The Trump administration has proposed cutting work-study spending nearly in half. Employer tuition assistance and private scholarships from Rotary clubs and chambers of commerce, too, benefit wealthier people more than poorer ones, who often don’t know about the aid or whose schools don’t have enough college counselors to help them get it. There is more than $17 billion available annually from such sources, the College Board reports; more than 10 percent goes to families earning $106,000 and up, and about 60 percent goes to those with incomes above $65,000, the U.S. Department of Education calculates. States also provide more than $10 billion in financial aid to students, according to the College Board. But as they try to keep top students from moving away, the proportion of that money being given out based on measures other than need has risen from zero, in the early 1980s, to nearly a quarter of state financial aid today. Experts say that even “free college” in states including New York – where it eventually will be extended for state schools to children of families with earnings of up to $125,000 – is likely to benefit wealthier students more than lower-income ones. That’s because it kicks in only after students already have exhausted all of their other financial aid. Students from higher-earning families who don’t qualify for things such as federal Pell Grants will end up getting bigger breaks than lower-income students who do. 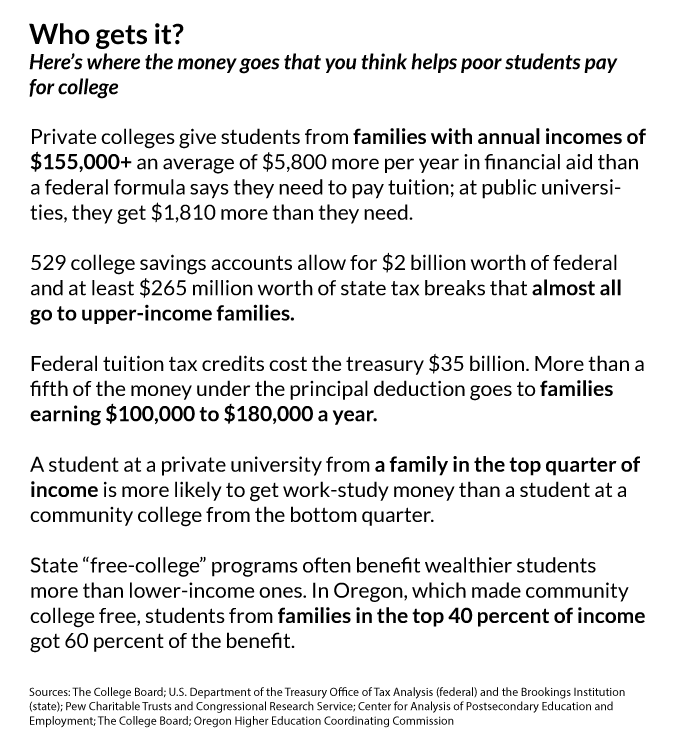 In Oregon, which has made community college free, students from families in the top 40 percent of income got 60 percent of the free-tuition money, the state’s Higher Education Coordinating Commission found. Oregon officials have since have changed the eligibility requirements, disqualifying the wealthiest families from the program. Unsurprisingly, given these trends, the proportion of low-income people getting degrees is declining while the proportion of higher-income ones continues to go up. Students from higher-income families today are nearly nine times more likely to earn bachelor’s degrees by the time they’re 24 than students from lower-income ones, up from about seven times more likely in 1970, according to the Pell Institute for the Study of Opportunity in Higher Education. Those low-income students who do make it into college are much more likely to enroll at for-profit universities, where graduation rates are the worst in higher education, or thinly stretched regional public ones. At community colleges, which spend less per student than many public primary and secondary schools and where the odds of graduating are also comparatively low, about 4 in 10 of the students are low-income, according to the American Association of Community Colleges. The policies perpetuating this aren’t likely to change in the current political climate, experts said. As hard as it was for her to afford, Portillo hugely values her Cornell degree. This story was produced by The Hechinger Report, a nonprofit, independent news organization focused on inequality and innovation in education, in collaboration with Reveal from The Center for Investigative Reporting. Sign up here for our higher education newsletter.